DearMYRTLE's Genealogy Blog: Follow up: Is there such a thing as ethical plagiarism? Follow up: Is there such a thing as ethical plagiarism? Earlier today I posted "Is there such a thing as ethical plagiarism?" 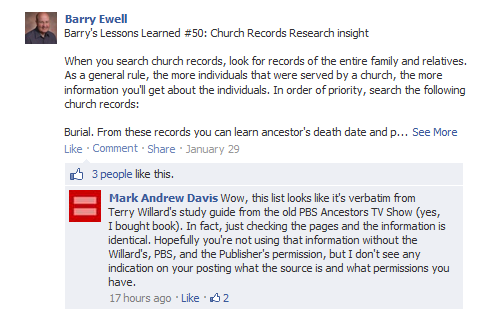 including the following screen shot featuring a comment from Mark Andrew Davis. He noted the text in Barry's Lessons Learned #50 matched precisely the text from a book published as the companion to the BYU Ancestors production for PBS. Barry Ewell Facebook Fan Page, 27 June 2013. (https://www.facebook.com/photo.php?fbid=466799326700942&set=a.418756651505210.85472.406378449409697&type=1 : accessed 6 July 2013 at about 1pm Mountain Daylight Time). Barry Ewell Facebook Fan Page, 27 June 2013. (https://www.facebook.com/photo.php?fbid=466799326700942&set=a.418756651505210.85472.406378449409697&type=1 : accessed 6 July 2013 at 10:25pm Mountain Daylight Time). I invite Mr. Ewell to explain away the confusion I've encountered and answer the questions posed by Mr. Davis and myself in my initial blog post. Ol' Myrt is now going to ask Mark Andrew Davis to share his findings with me. I'd like to understand why such a bold statement was made. My copy of Terry Willard's Ancestors: A Beginner's Guide to Family History and Genealogy is still packed despite my best efforts to locate same this afternoon. I cannot check and do my own comparisons. IMAGE: A file from Wikimedia Commons. It is simply unclear why the comment was removed from Mr. Ewell's Facebook posting and by whom. 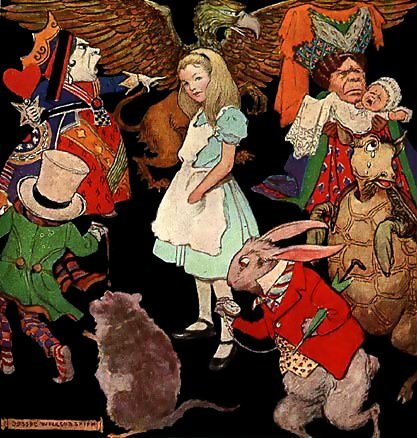 Indeed Ol' Myrt finds this "Curiouser and curiouser", sorta like the gal who first uttered these words in popular fiction after a startling fall down the rabbit hole. I sincerely wish this is all just a bad dream. I would think BYU would have something to say. And the funds to back it up. You said: "It is simply unclear why the comment was removed from Mr. Ewell's Facebook posting and by whom." You made a mistake in that statement in your blog post. You should replace "simply unclear" with "perfectly obvious". It seems that this is his MO and he's done it more than once. I refuse to use his website or watch his webinars. I want absolutely nothing to do with him in any way shape or form.